Weave is an incredibly simple, effective productivity iPhone app from Intuit. It is the perfect companion for a small business owner, freelancer, or mom on the go. The fresh, clean home screen welcomes you with the to-do items and projects for the day to help you stay on task. There is no complicated set-up, no shortcuts to memorize, or screen after screen of expanding details. With the guidance of excellent pop-ups, you add your first item to the Weave iPhone app to-do list. You simply press the plus icon. A screen with perfect and succinct fields for data appears. You describe the task, add to a project, assign to yourself or someone else, and enter a due date. You can monitor the time you spend on a to-do task as well. This is a great tool for entrepreneurs who must religiously track billable hours. 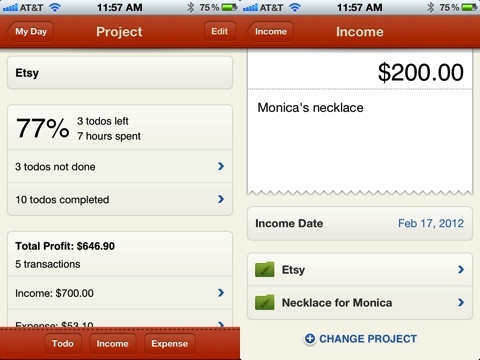 With the Weave iPhone app, you can also simply track income and expenses. Like the data entry of to-do items, you press plus to add an income item or expense item. A calculator appears to enter the amount. Then, you give a description of the item to help you track the details. You can record the date as well. With Weave, the interface gives you all of the pertinent fields to complete, but not too many. The data entry does not become cumbersome and over-bearing. You’ll appreciate the excellent home screen for each project. You can monitor your progress with a list of outstanding tasks to finish. If you love to mark through items on your list, you’ll appreciate Weave for tracking your successfully completed tasks. You have a picture of your project’s profitability with a synopsis of income and expenses. Intuit, Weave’s developers, have incorporated some excellent navigation features. The most striking is the hide tool. When you need a keyboard to enter details, it appears. When you are finished with typing, but still need to add and adjust items for a to-do task, project, income, or expense, you press the icon to hide the keyboard. This is an excellent functionality that more iPhone apps should incorporate. The hide tool also works with the calculator that pops up to perform numerical data entry. According to a pop-up on the income screen, you can also incorporate Intuit’s credit card payment system via the weave iPhone app. If you need a more thorough productivity iPhone app that incorporates a myriad of details, then Weave may not cut it for you. Weave addresses the critical tools required of a great productivity app with attractive, streamlined interface. And, it’s free. 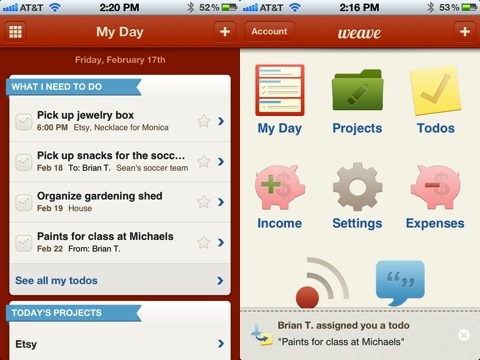 AppSafari review of Weave was written by Jenni Ward on March 12th, 2012 and categorized under App Store, Enterprise, Notes, Productivity. Page viewed 4814 times, 1 so far today. Need help on using these apps? Please read the Help Page.